If you want to customize multiple play lists, the iPod Shuffle is not for you. OTOH, version 4 is better in that it allows you to use its features without requiring the Apple earbuds. Sound quality is ok at 128k mp3 — the only way to get a six hundred or more songs onto one (higher resolution=fewer songs). If just loading up a bunch of tunes for all day listening, this is perfect. If you want to control multiple play lists, you want one of the higher models. Although these are now discontinued, new and barely used units are found on eBay. Mine is the darker blue but it came in other colors. 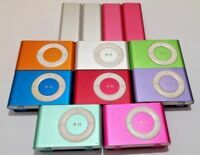 The pic with 5 shows the first set of colors from 2015; these were discontinued in favor of the second set of colors as shown in the picture with 7 ipods from 2016. There is no other change between the two years. I like iPods because I can listen to many hours of music without draining the battery in my iPhone. I’ve never been able to use this. It will keep a charge for 5 minutes and then it is dead. The charging cord that came with it didn’t work at all. The apple certified charger I already that could work for this device will activate the charging when plugged to power but once disconnected, it will not sustain it’s charge and the notice “battery low” is immediately heard through headphones. I have not been able to use this purchase at all! The iPod Shuffle works pretty good. I enjoy swimming with music. I say pretty good because of the ear pieces. I am happy with the Shuffle, I struggle with the ear buds. I have to be careful when attempting to remove them, the rubber pieces tend to pop off and remain in my ear. Also trying to get a good seal so Water doesn’t enter is another challenge. But seller did great with shipping and the device works as described. I tried the Finis bone conduction but my second pair of Finis has failed for the same reason, won’t charge. I am hoping the iPod holds up better. I also like how easy the Shuffle syncs with iTunes. Although it requires a different charger than the first generation...the features are also enhanced. It is more universally compatible in formats and loading music seems easier now. The battery life is what made me go back to the shuffle. Amazing battery life, even with a pre-owned device. Easy to transfer into your account too. Save your money. buy a higher end ipod. This is my first I pod Ive been useing cd players before that tape cassette, before that 8-track tapes,, with cd-rw's to make my own song list. I thought Id try the shuffle because I won it on a auction on EBAY, I tried to bid on the newsest ipods, but always was overbid. First let me say when I got it in the mail , it came with no instructions, and as soon as I plugged it in to my Mac it was not compadable with my current MAC OS system and Itunes so I had to upgrade to MAC OS Snow Leapord and Itunes 10, before it would even reconize the player. After loading my mp3's I found the included Mac in ear phones, terrible to try and put in my ear and hurt like hell to wear. So I use my Over the ear head set, the faetures are limiting on this ipod, and its so small its easy to lose. The sound quality Im not impressed by it. And thiers no way to select songs. In the future I will buy a newer ipod model, I would not reccomend this model, its a waste of money.